Children of all ages came to the Keyhole Wednesday for the free sack lunch. 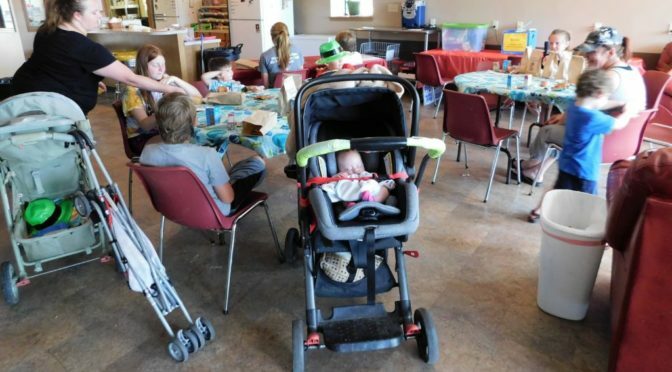 Communities in Bourbon County have taken advantage of the government’s opportunities to feed children and youth for free this summer. 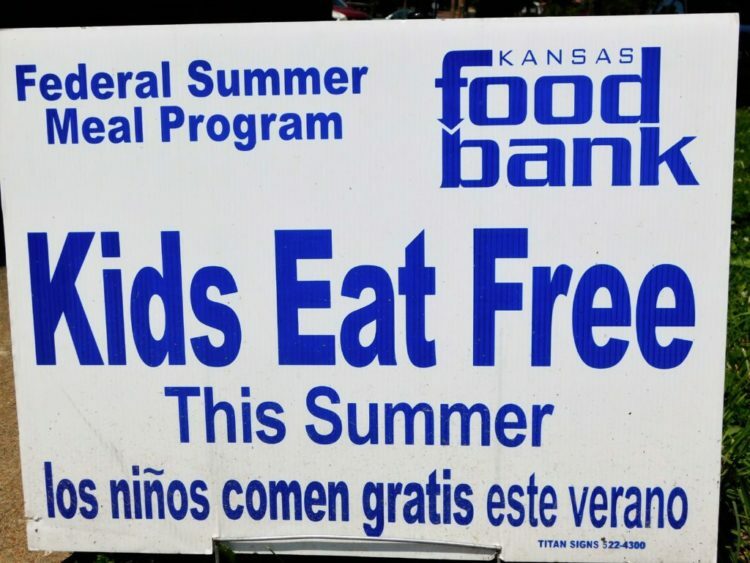 The Kansas Food Bank Federal Summer Meal Program provides free shelf-stable food for area youngsters up to 18 years old at the Keyhole Youth Center, 1002 S. Main, across from Fort Scott High School. The program started May 29 and serves lunch from noon to 1 p.m. and will continue until July 29. 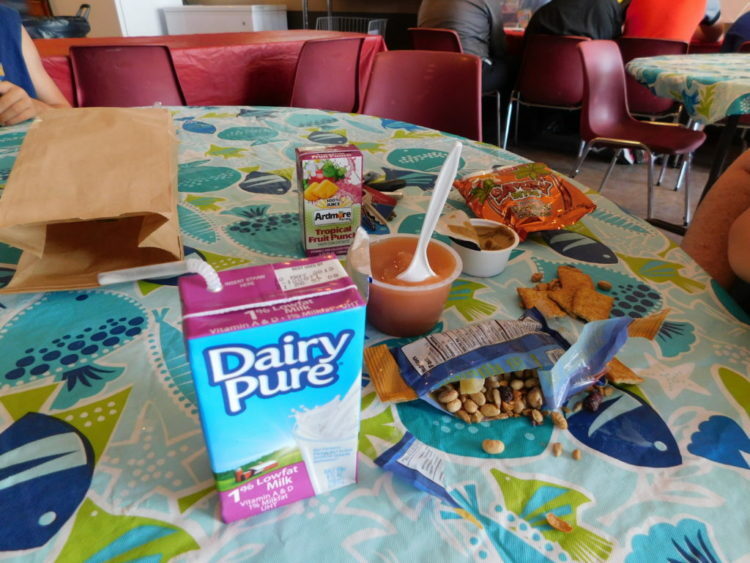 A look at what is inside the free sack lunch offering at the Keyhole Youth Center. 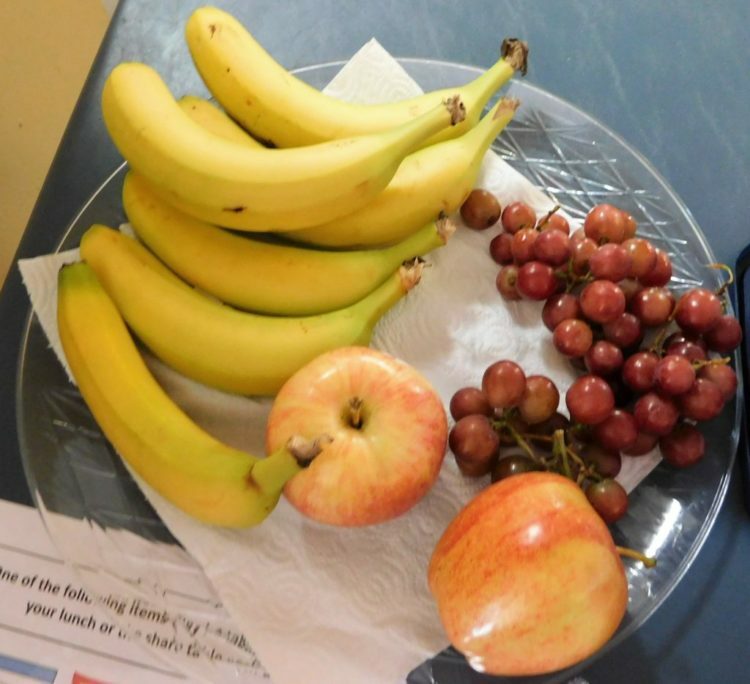 Fresh fruits are provided with the free sack lunch by The Beacon. 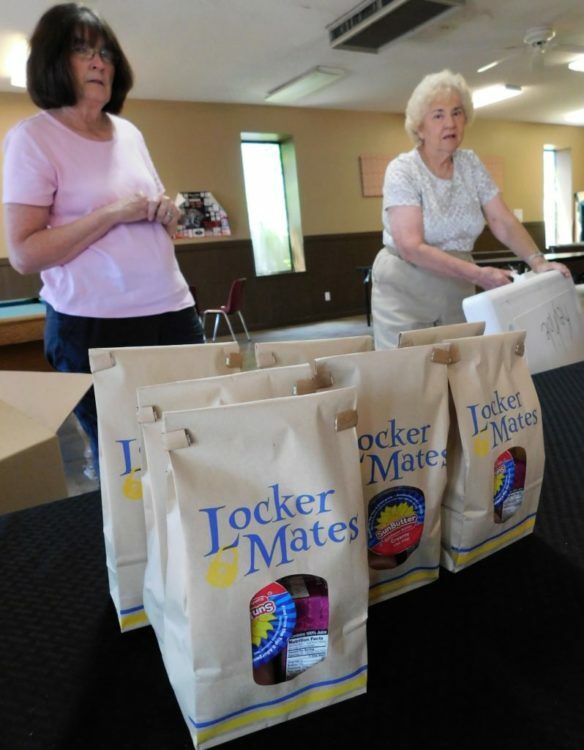 On Wednesday, May 30, Diana Spencer and Joyce Gobl helped serve the free sack lunches at the Keyhole. Community groups volunteer their time to help serve the meals: Mondays the First Methodist Church serves, Tuesday-Fort Scott Church of the Nazarene, Wednesday-Pioneer Kiwanis, Thursday-City of Fort Scott, Friday-First Presbyterian Church and Community Christian Church. On May 29, the first day of the food program there were 28 children who were served, according to Bethany Hartford, Keyhole director. Hartford coordinates the meal program with Dona Bauer. Uniontown’s Food Service Director Michelle DeMott is facilitating the Summer Food Service Program for USD 235. It is sponsored by the U.S. Department of Agriculture. The food is free to children birth to 18 years old, DeMott said. “It is no cost, regardless of any financial standard,” she said. 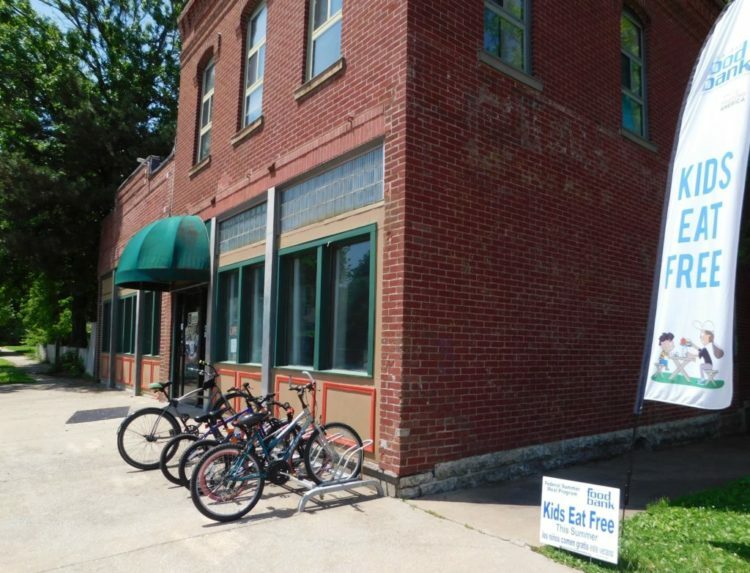 Their program offers cooked breakfasts and lunches Monday through Friday and starts next Monday, June 4. Breakfast is from 8:30 to 9 a.m. and includes such menu items as biscuits and gravy, breakfast pizza, waffles, cereals, donuts, cheese, and yogurt, plus milk and juice. Each day features a different menu. Lunch is from 11:45 a.m. to 12:15 p.m. and includes the standard American diet offerings of hot dogs, spaghetti, tacos, hamburgers, and sandwiches. The school has a summer school program, of which the food service is a part. But other children in the community may come for the food at breakfast and lunch, she said. Additionally, the Uniontown High School weight-lift program and the volleyball practice students come to the meals, DeMott said. The meals are provided at West Bourbon Elementary School, located at 602 Fifth Street. Bronson and Redfield communities will also have meals available at the same time at the Bronson Community Center, 503 Clay, and the Marmaton Community Church, 102 Cedar in Redfield. Community members volunteer to facilitate activities for the youth in these communities, she said. “Some had parents not at home and who didn’t want to go home,” DeMott said.